Isn’t that awesome? Like I want my whole life to be made out of that fabric. Also, did you notice we’re still inside a perenthesis? We are. I doubt this is grammatically acceptable but you know what, I WANT TO LIVE!). Yes, girl. We love watching things and we love doing it together. Because what’s the point of watching an awards show if there’s no one to make fun of Kate Hudson’s dress with or no one to exclaim “DOES MERYL EVER DO ANYTHING WRONG!? !” This year, I’m going to be in New York for Oscars. Which I have to be totally honest and say I’m kind of bummed about. I was there for Oscars last year and I kept being like “What are you guys doing for Oscars?” and everyone just looked at me like I’d just asked them whether they were using HR Block or TurboTax this year. I GET IT. IT’S WEIRD. I COME FROM A PLACE WHERE WE GET EXCITED ABOUT STUPID INANE STUFF. I’M SORRY. Going to New York didn’t stop me from writing a totally preachy and annoying post about what I think you should do for Oscar. I have a few caveats, obviously. Firstly, if someone invites you to watch the Oscars at their glamourmansion, watch the Oscars at their glamourmansion. I’ve spent many a year watching a the Oscars at glamourmansions and it’s always better. Mostly because there’s more space but also because glamour mansions tend to be owned by rich people and rich people love catering. Catering means you won’t have to worry about what you’re going to eat because it’s obviously going to be delicious. And you’ll never have to make your own drink because they’ll have a bartender there to make your drinks and validate you even if you’re a horrible person. So yeah, if a rich person invites you over to partake in their ridiculous wealth, do that. But if, like me, you’re left to your own defenses to create a lovely and meaningful Oscar experience, follow these simple instructions. Mix Italian Blood Orange Soda and Vodka, add lemon juice. Make 8 generous drinks. Try not to drink all of them yourself. Do the Oscar ballot thing it’s dorky but more fun than you’d expect. 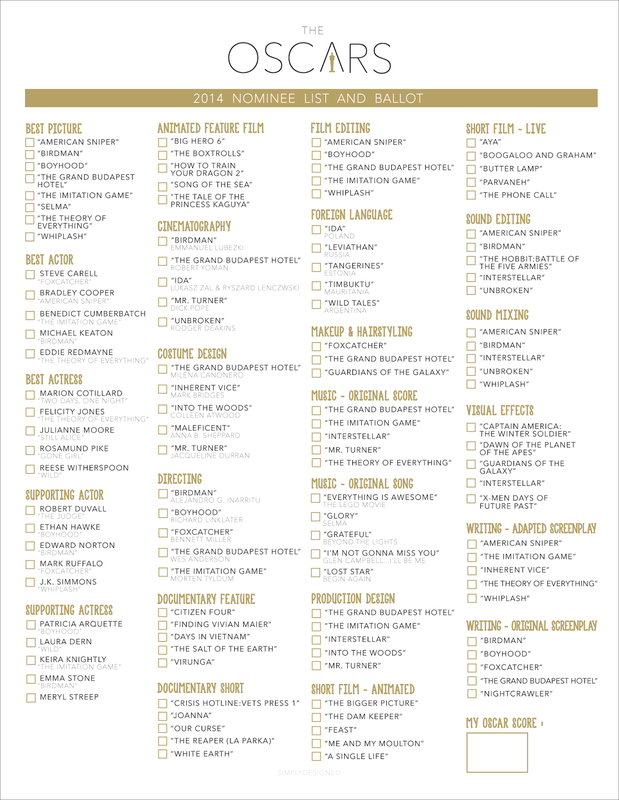 Download a simple Oscar ballot and make enough copies to share with your guests. I found mine here. Whoever guesses the most wins is better than everyone else. Make everything look better by plating it well. For snacks, I went full-on cheap. But like, not in a depressing way where people would feel deprived. In a tricky, deceitful way aimed at making them think they were getting much fancier food than they actually were. I spent about $80 on snacks which could be cooked easily and plated without a bunch of fuss. I bought a lot, but figured we could just order out if we got super hungry later. Make it festive by adding flowers. I didn’t go all out streamers and confetti and little gold Oscar statues everywhere. Instead, I opted to cover my apartment in beautiful flowers I ordered from TheBouqs.com, a super streamlined service that allows you to order flower and have them delivered to your home (or office, if you’re trying to impress your coworkers and make them think you’re popular). If I hadn’t have had flowers I may have gone crazier with Oscar themed decor, but they added such a simple sophisticated party look that I didn’t want to distract. Incorporate an Oscar-y element into your decor. I decided I was going to hone in on red, which is normally a color I hate in design. I don’t know why, it just always seems too garish to me. I’m like, SHUT UP, RED! But I took inspiration from the red carpet and added some scarlet to the viewing space, to match the Scarlet Johanssen we’d be watching later on the screen. I put popcorn in this ultra glamorous bowl and provided happy little red cups for consumption. I swapped out my Erika Gragg paintings for some new Erika Gragg paintings. The new ones, in beautiful blue and coral pink, tie in the red color story and my navy sofa. THANKS, PAINTINGS! (These paintings are for sale BTW, contact me or Erika through her website to buy). If people get bored, cook a pizza! When the show starts to drag and people start wiggling around and getting antsy, keep them engaged by bringing out a piping hot pizza. This will make them think “Hey! This night’s not over yet! There’s pizza!” Nothing gives assures people that all is right quite like pizza does. I love handmade pizzas with homemade dough, but I was too busy so I picked up some ready made that just needed to be plopped in the oven and they were delicious. In an ideal world, we’d all eat handmade things all the time. But sometimes, togetherness and eating junkfood are more important than perfection. If it weren’t for these rainbow carrots I’d totally be dead right now. I’ve roasted them, I’ve made them into soup, I’ve made them into Paleo smoothies. They’re literally 90% of my diet. So why not include them in my Oscar party? They go great with guacamole for a healthier viewing snack. My French boyfriend loves cheese, so I made sure to have a few different types to impress him. What I learned: It’s impossible to impress a French person with cheese bought in America. Shut up and listen to Jared Leto’s hair. I have a lot of performer friends, so watching awards shows with them is like watching a sing-along childrens program with a bunch of children with blabbing syndrome. I’m not a SHHHHusher (you know, people who are like “SHHHHHH!” all the time like old-school librarians), but I do enjoy watching the show so I try to lead by example and keep my mouth shut, no matter how ridiculous the speeches are or how ugly the dress is. There’s always time to share your thoughts with your friends after the show. Or you can just be a normal person and sit there sharing them on the internet the whole time you’re watching. I hate to leave off my tips by telling you to shut up, but I bet you agree. Sometimes it’s nice just to watch something together with your friends. In silence. While eating carbs. Now hurry, there’s only a few days to go until you A) Find a glamourmansion or B) Plan your own simple (yet glam) get together. If you hate the Oscars, I don’t know what to tell you. Maybe throw a fun party and just call it “brunch.” Or just give in, live a little, and host a lazy Oscarparty like an honest, hardworking American. Sources: The Bouqs, Ben Medansky, Crate & Barrel, Erika Gragg. Shut up and listen to Jared Leto’s hair… LOL I love you, Orlando. Srsly. Love these ideas! I’m definitely watching! Even if it is really hard to want your french friend to impress, it is very sweet to you to thin about it! You deserve the Oscar of the best Maître de maison! Congrats Orlando!!! Sorry about my awful typos…. I-apostrophe-m and f-r-o-m spells from. Mostly I love that you have last year’s Oscars on your DVR still (or you’re streaming from your computer via Apple TV), and that you included them in the photos. Especially because Jared Leto is my hair idol. “But sometimes, togetherness and eating junkfood are more important than perfection” <—- truth. Where are the pizza cutters from? Please, please tell me the source of the blue dot pillow on your couch. I’ve seen them (or similar) in a few blogs and magazines, none of which list the source. I want, I need…do tell! I adore your style soooo much! I’m trying to mimick your bookcase and tv stand. Send me how you painted the tv stand with white paint and bookcase dimensions. It’s a perfect match! Thanks!